It is also called “the Peltier Effect” after the French watchmaker who discovered the phenomenon in the early 19th century. Like their conventional refrigeration counterparts, thermoelectric cooling systems obey the basic laws of thermodynamics. However, the actual system for cooling is different.In a conventional refrigeration system, the main working parts are the evaporator, condenser, and compressor. The evaporator surface is where the liquid refrigerant boils, changes to vapor, and absorbs heat energy. The compressor circulates the refrigerant and applies enough pressure to increase the temperature of the refrigerant above ambient level. The condenser helps discharge the absorbed heat into surrounding room air. The three main working parts in a thermoelectric refrigeration system are a cold junction, a heat sink, and a DC power source. Two dissimilar conductors replace the refrigerant in both liquid and vapor form. The cold sink (evaporator surface) becomes cold through absorption of energy by the electrons as they pass from one semiconductor to another, instead of energy absorption by the refrigerant as it changes from liquid to vapor. The DC power source pumps the electrons from one semiconductor to another, and the heat sink (condenser) discharges the accumulated heat energy from the system.Therefore, the thermoelectric cooling system refrigerates without refrigerant and without the use of mechanical devices, except perhaps in the auxiliary sense. The semiconductor materials used in thermoelectric cooling are N and P type, named because they either have more electrons than necessary to complete a perfect molecular lattice structure (N-type) or not enough electrons (P-type). The extra electrons in the N-type material and the holes left in the P-type material are called “carriers,” responsible for moving the heat energy from the cold to the hot junction. Good thermoelectric semiconductor materials such as Bismuth Telluride greatly impede conventional heat conduction from hot to cold areas, yet provide an easy flow for the carriers. Traditionally thermoelectric modules have been rated at two points under two conditions. The first point is the maximum load (Qmax) at zero degrees delta-T and the second point is the maximum delta-T at a no load (Q=0). The load is defined as the amount of energy removed from the cold side ceramic. The delta-T is defined as the temperature difference between the cold side and hot side ceramics. Extensive curves showing the performance under other conditions are often available. Reputable system manufacturers rate thermoelectric systems in watts or BTU/HR under zero degree delta T conditions. In this case, the load is defined as the amount of energy removed from the cooling medium. For air cooled systems the delta-T is the temperature difference between the cooled medium and the ambient air. The cooled medium would be a cold plate in direct contact applications, a fluid such as water in liquid chiller applications and the enclosure air return temperature in air conditioner applications. The Europeans have developed a standard, DIN 3168, which specifically addresses enclosure air conditioners or coolers for distribution boxes. This standard does contain temperature information specific to the rating of such air conditioners. The load or the “useful cooling capacity”, is only the useful sensible heat flow which is taken up by the appliance for lowering the inside temperature of the distribution box. The temperature rating conditions for DIN 3168 are for the evaporator inlet (enclosure) temperature and condenser inlet to be an equal 35 °C, or for the evaporator temperature to be 35 °C and the condenser temperature to be 50 °C, stated L35 L50. AHP-1200. The top curve is shown per DIN 3168. In this curve temperatures are represented as absolutes, the x-axis represents the inlet temperature at the condenser (the enclosure temperature), the vertical axis represents the useful cooling capacity, and separate load lines represent various evaporator inlet temperatures (ambient temperatures). 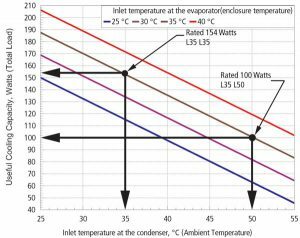 Plotting a vertical line from the condenser inlet temperature to a specific evaporator temperature line and from that intersection horizontally, provides the useful cooling capacity. The bottom curve is for the same product represented in the traditional format. Here the temperatures are presented as differentials. Plotting a horizontal line from the desired delta T to intersect with the selected performance curve and then vertically to the x-axis provides the cooling capacity under that condition. 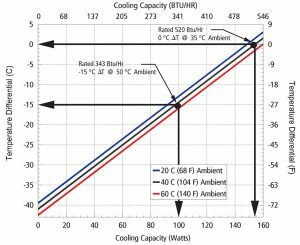 Both types of curves accurately represent the performance of a thermoelectric cooling system. The rated performance value shown for a positive 20 °F delta-T condition is true. However, TECA does not consider a 20 °F delta-T to be a valid rating condition for an air conditioner. This value is only shown for the purpose of competitive parity with those manufacturers who choose this condition for rating their products. A performance rating stated at the positive 20 °F delta-T condition is more appropriate for above ambient heat exchangers such as heat pipes or for specific applications where it should be clearly stated. Air Conditioners:Air conditioners come in many styles to meet many needs. These styles are indicated by the prefix and the suffix in the model number. The suffixes are “AHP”, air cooled heat pump, “FHP”, flush mount heat pump, and “LHP”, liquid cooled heat pump. “XP” style products are designed for hazardous (explosive) environments. They typically use military grade fans on the exposed side of the unit with other design modifications required for the environment. Most have been evaluated by an NRTL as if they were open to the environment. “CXP” style products, on the other hand, require a source of compressed air and are usually used on purged systems. NRTL evaluations are then performed on the entire system. Those products whose model number has no suffix or end in “FF” are for a more benign factory, laboratory or office environments on NEMA 12 enclosures or similar. The products whose model numbers start with “LHP” use a liquid plate heat exchanger. By their nature, these products do not have to be exposed to the environment at all. They can be mounted so they are completely inside of the enclosure. For this reason, the suffixes described above are used but they are not as completely descriptive as they are for the air cooled series. Standard liquid chillers (prefix “TLC” and “RLC”) are all air-cooled products. They come in versions VAC or VDC, with or without temperatures controls or pumps. The TLC-1200 is a compact general purpose liquid chiller. The TLC-700 is a compact liquid chiller including reservoir, pump, and several controller options. The “TLC Cube” products are for building into OEM applications, come in many capacities and a wide selection of input voltages.